I know it is cold outside and that long, hot shower or bath sounds so amazing but it is one of the worst things you can do for your skin. Keep your showers brief and use lukewarm water. The heat from the water breaks down lipid barriers in our skin. This leads to loss of moisture. If you want a bath, use lukewarm water with oatmeal or baking soda which will also help relieve drying, itchy skin. Try the MyBody Probiotic Bath + Shower Gel whose sulfate-free and paraben-free formula is great for all skin types. Avoid any harsh skin treatments such as chemical peels and any alcohol-based products. Those products strip any vital oils from the skin and can make any dryness worse. Try using products for sensitive skin. MyBody’s Clean Routine is a great gentle skin-calming anti-aging cleanser. Afterwards, dry off by patting with your towel and do not rub. Use humidifiers around your house or office space to increase moisture levels. Humidity levels should be between 30% and 50%. Exfoliation is still essential in that cold, dry weather. Why? Exfoliation removes the dry, flaky, dead skin cells making new cells available to accept moisture. However, exfoliation is only good in moderation! Only mechanically exfoliate once a week and avoid any harsh exfoliation. 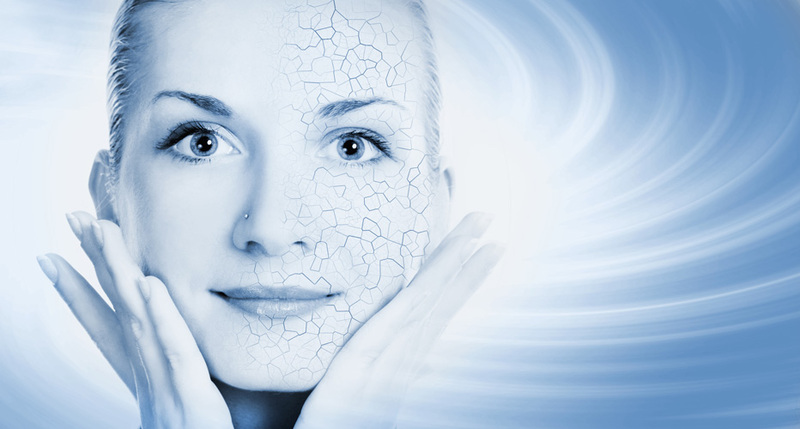 Too much exfoliation can damage your skin. The MyBody A-Team has the perfect amount of retinol that is good for both aging and acne skin to be used every or every other night. I cannot stress that enough! It is best to apply immediately after washing while your skin is still damp to lock that moisture in. Read your ingredients! Some pump formulas are often diluted with water or even worse alcohol. For dryer skins, try an oil-based formula. Oil creates a protective layer that retains moisture. However, be sure to use non-clogging oils for the face. We love the MyBody’s myHERO Anti-Aging Growth Factor Daytime Lotion and Ultra Rich Anti-Aging Growth Factor Cream for dry skin. How about the MyBody’s Break Free Hydrator for oily skin! Yes, you absolutely should still use sunscreen in the winter! It is not just for the summertime. That winter sun mixed with the glare of the snow is still damaging to the skin. A broad-spectrum sunscreen that protects against both UVA and UVB rays is best. The MyBody Protect & Serve is a great broad-spectrum sunscreen for all skin types. The Tinted Sun Shield also works as a great make-up primer! Cracked Lips and Red, Rudolf Nose? Do not lick your lips! I know it is tempting but the saliva attracts moisture from under that surface of your skin and brings it to the surface where is evaporates. Additionally, digestive enzymes break down the skin leaving your lips than they were before. Use a well-formulated, conditional lip balm. Be careful of ingredients, menthol can be irritating. We have great lip balms in the office that contains soy, candelilla, beeswax and shea butter. On your nose, use extra soft-tissues. Blot only! Do Not Rub! This can make that redness and dryness worse. You can apply a thin layer of moisturizing lotion often. Do not go around in shorts and a T-shirt! Wear a coat, gloves, a hat and even a scarf. Wear breathable fabrics and loose-fitting clothes. Yoga pants may be comfortable but are unfortunately too tight. Avoid wet clothes especially socks and gloves. If you choose any wool clothes, be sure to line with cotton first; even gloves. Wool can irritate the skin. Stay Healthy and Relieve Stress! Infections and emotional stress can make psoriasis and eczema worse. Wash your hand frequently and be sure to get a good night sleep. Exercise often and take in lots of water and vitamin C. Skin has a hard time retaining water during stress. Flu shots are important and highly recommended especially if you are often around others or children. For more information on how we can help you with your specific skincare needs, Contact Us at 614-459-0060 and speak with our Aesthetician, Jenna. Also see updates and specials on her Facebook and Twitter accounts.